Senator Jeff Merkley thinks it is vital to hear from you in person given all the issues swirling around Washington DC. This is my first town hall – how does it work? First, keep in mind that town halls are different from campaign events. These are official business in the elected person’s capacity as a member of congress. They are paid for by taxpayers. With that in mind, there are some restrictions on what the elected person can do. For example, they can’t sell campaign merchandise or distribute campaign literature. The elected person will give an update on current priorities that will last 15-30 minutes. Then, the floor is opened to questions. Many will want to ask about the most high profile questions of the day. If the elected has already addressed the topic, you might not get as complete and satisfying a response. Try to think of different ways to address the topic while including a very brief personal touch. Only ask one question. Trust that someone else will get to your other questions. Have your questions ready and written down. Put each question on a note card if it helps and stick the ones that have already been asked in your pocket. Practice asking your questions at home so that you sound confident, passionate, and knowledgeable. But, don’t worry, everyone gets nervous when their turn comes! When planning a good question, develop a root and branch strategy: have a root question (say, on healthcare) and then branches that grow from that question with more specific, actionable items to be addressed. This helps you when someone else beats you to your question – you’ll be ready with a more detailed alternate question. Have 3 or 4 alternates for each topic that most concerns you and you’ll be sure to have a good question ready when your number is called! Keep the whole thing short and keep the background to a minimum. The shorter the better! That said, if you are asking about a specific piece of legislation or something that hasn’t quite been in the headlines, quickly summarize it before asking your question. It’s hard to remember every issue that comes across your desk. Avoid yes/no questions. That is essentially asking the elected to jump directly to their canned talking points. Frame your question in a positive way. Put the question in such a way that it gives them the opportunity to do a good thing, rather than having to combat a negative thing. But, again, be mindful of leading questions. Include a personal touch – but don’t let it overshadow your question. Questions resonate better if you can show a personal connection or how the issue affects you and your community. Do your homework! Look at how they’ve addressed these issues in the past, anticipate their response, and design your question to go beyond the usual. But also make sure you have your facts and background airtight. Otherwise, it gives them the opportunity to wiggle out of giving a good response and step back to talking points correcting you. Then they can say they’ve answered the question already when all they did was dodge your poorly formed question. Always be respectful. Folks will disagree. Some will flatly be wrong. A few will be jerks. The way to address that at an event like this is by making sure you’re right and being the better person. There is a big audience watching you and your actions can be used to tar not just you but your cause and your allies. Don’t feed the trolls. Stick around and mingle. There will be a lot of like-minded folks working toward the same goals you are. You might just meet someone interesting here! Talk to a staffer – or even the elected himself. The elected official almost always hangs out for a few minutes after the event and takes questions one-on-one. Just be mindful that it might not be possible at larger events. Still, staffers can be helpful too! Get there early to settle in, but no more than an hour early. Generally around an hour and a half. Yes, with some light rules. Signs on a stick aren’t allowed and large signs will be directed to the back. That’s it. Please be courteous and mindful of your neighbors when holding signs. Everyone else wants to see too! Can my group set up a table, distribute literature, or collect signatures? Not inside the event. Again, town halls are different from campaign events. You may do as you like outside of the event area, but the venue host may have its own rules to be mindful about. Can I go to an event in another county? Sure! Just be respectful of others and allow locals priority in asking questions. Sometimes it can be illuminating hearing the difference in emphasis that folks in other places have in their questions. Understanding those differences allows us all to better engage and compromise when it finally comes to policy. Always! When elected officials or campaigns come to visit a town, they usually call on the local party for help. We call on our stable of most reliable volunteers first and may issue a call to action if we need more help. Be sure to fill out our skills & interests survey or just email us if you’d like to get involved in this way at future events! How can I find out about these sorts of things in the future? Follow us on Facebook and Twitter or contact us and ask to be added to our mailing list! Also be sure to add Senator Jeff Merkley if you’re on Facebook or Twitter and want to hear how he’s fighting for you every day! Please contact us if you have any questions regarding these events and we’ll do our best to get you answers in time. 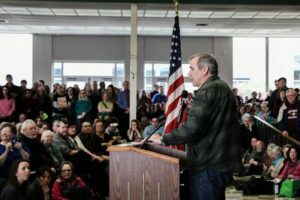 Senator Jeff Merkley, Town Hall. Bookmark.